Kata kunci: Maqâsid al-Sharî‘ah, turuq al-ithbât, istiqrâ’, dan wâdih al-dilâlah. This article attempts to analyze how to know maqâsid al-shari‘ah in any statutes of shari‘at with Muhammad Tâhir b. ‘Âshur’s perspective in the book of Maqâsid al-Sharî‘ah al-Islâmîya. This study concludes that the formula of turuq ithbât maqâsid al-shari‘ah in the perspective of Ibn ‘Âshur refers to three ways: first, through istiqrâ’ (inductive), be it istiqrâ’ on the known-rationale laws, or istiqrâ’ to the postulates of the law which has the same substantive rationale (mushtarak fî al-‘illah), in which the existence of the rationale qualify as maqsûd al-Shâri’; second, through the verses of the Quran which has the clarity of the arguments (wâdih al-dilâlah); and third, through the text of Sunnah mutawâtirah, either mutawâtir ‘amalî or mutawâtir ma‘nawî. Aziz, Muhammad. 2014. 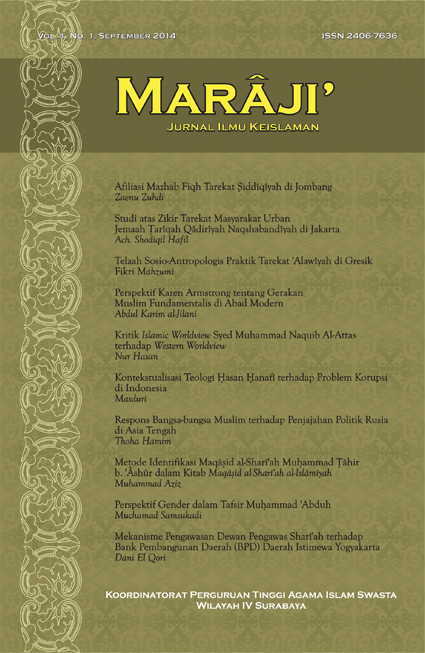 Marâji`: Jurnal Ilmu Keislaman 1 (1), 216-41. Accessed April 25, 2019. http://maraji.kopertais4.or.id/index.php/maraji/article/view/16.